Since the inception of this business world, there is one document that all business founders use as a tool to explain their business model, set the direction for the business and also to craft their brand messaging. That document is called a business plan. There are some business experts who argue that business plans are dead. Are they? A business plan is the first document you create after you lay down the basics of your company. It serves as your mean to explain where you are right now, where you are headed and where you want to be. Creating a solid business plan is the need of every business and it takes time and energy to make it exactly the way you want to. The language and format can become a tedious process if you lack resources and expertise. How did the idea of OGS Capital come to your mind? Alex: We started off by creating business plans and providing business consulting services to companies from TOP1000 Fortune list during our careers in the world-known consulting companies like Deloitte, PWC, Bain, etc. At some point, my partners and I decided to start our own consulting company focusing on startups and small and medium businesses to implement the best practices we learned throughout our careers. OGScapital was then established in 2006 to serve this purpose. Why do you think business plans are necessary for businesses in this age? Alex: The business plan helps build a roadmap of your business development efforts and also helps to structure your business model. In addition, it also helps to access the market and forecast the financial results and returns of your organization. At this age, with the dramatical development of modern technologies and new types of businesses, it is very risky to start a new business without preliminary assessment of the market potential and developing an approach for running the business. This is where our services can help. Our clients are also using our business plans for fundraising purposes. It is a common practice to show it to investors nowadays. Keeping in mind all the hats that entrepreneurs wear, when do you think is the right time to finalize the business plan? Alex: The outlining of a business plan should be initiated when the business idea is formulated so it can help to check its viability and attract the funding. The business plan is a live document and it should be updated/revised in the due course. Do you think business plans play a vital role in raising investment for a startup? If yes, how? Alex: Yes, it is critical for fundraising. All investors/lenders require the business plan before taking any investment decision. As per OGScapital experience, different investors have different specific requirements about a business plan and it’s our job to meet their expectations. Do you also consult startups with their existing business plans? Alex: Absolutely, we provide full-scale support to startups, not only for creating the business plans but also reviewing the existing document, developing the business strategies, marketing plans, conducting due diligence, mentoring and as well. The business plans are template based or you customize it as per the needs of your clients? Alex: Our philosophy is not to use any templates and software. We create all documents from scratch as the quality of the tailored business plan is much better as compared to templates and it will increase success in fundraising. Our project team consists of a project lead and three MBA consultants: one is responsible for financial modeling, another one – market research and the third one takes care of business strategies and marketing. Tell me about your secret sauce? What are the main components you always prefer to include in any business plan? What more services are you planning to offer through OGS Capital? Alex: We are planning to expand our services to help the startups from initial fundraising to future exit of their businesses. Our service offering will cover all business support services to businesses for achieving their goals and become successful. Where do you see OGSCapital in the future? Any expansion plans? Alex: Our short-term plan is to create a platform where different service providers can offer their services to small and medium businesses. We want to help the businesses become more successful with the support of those who have the expertise. We see a lot of cases where people want to start their business but they do not have enough experience in setting the building blocks. So our vision is to support them by sharing our expertise and wide experience in various business aspects. Together we will make our world better. The global economy has been in a record shape for the last decade, with technology and digitization fueling growth in business markets globally. What has resulted, is an environment where the average person can casually accrue a huge variety of services, products, and devices that they want but do not need. A superfluous selection of products mirrors the content on these devices as well, which are overflowing with applications that were once trending or downloaded on a whim—but now waste memory and screen real estate as they clutter up our attention. Businesses often suffer a similar fate. These days it’s easy for a startup to build its foundational workflows on a series of apps and software products, using licensed enterprise software, cloud-based Software-as-a-Service (SaaS), open source, and frequently all the above in tandem. Together, this precarious collection of software may contain the functionality required for a business to operate, but a startup’s tech stack is often haphazardly managed without much consideration that its complexity may undermine output. With today’s startups often using dozens if not hundreds of apps and tech systems, it’s no wonder that minimalism has taken off in recent years. An obvious consequence of too many applications in your software stack is “context switching,” which is a type of productivity fatigue that comes from a lack of interface continuity. To be continually switching between tasks and environment means that employees work harder for a lower quality of work, and might lose up to 40% of their productivity as they hop between platforms. These days that’s the status quo, with people bombarded by notifications from Slack, text, email, Asana, Trello, social media platforms and more. Though it’s true that modern workers are bred multi-taskers and seem to thrive on it, confining the tech stack to a certain size is vital. To appropriate minimalist theories and apply them to the workplace is easy because less clutter promotes thought and creativity, whether we’re reducing the physical objects surrounding us or the many digital environments we jump between. It’s an ROI-positive endeavor. To start, it’s crucial to “zoom out” and gain a broad perspective on all the applications your employees use every day, just as you would organize the items in your home before determining which ones aren’t necessary. Organizational tools like Torii help in this regard by enabling your IT administrators to audit, connect, observe, and manage all your SaaS products from one dashboard. IT professionals are some of the most qualified in any organization to identify which apps are “one trick ponies,” and this is simple with full visibility of the software stack thanks to SaaS management solutions. It could be that you have six different apps that do six different things. Each might add value in some way, but context switching, elements of redundancy, and integration obstacles make for a bumpy workflow. Employees are able to do the same amount of work and at a higher quality when this multi-system chaos is quieted. Translating minimalist theories to a startup’s technology stack is difficult, but the opportunity cost of not doing so is great. A global study found that workers at firms which are “tech laggards” are five times more likely to experience frustration on the job, and if the technology is clunky, outdated, or haphazardly deployed, they are six times more likely to want to quit. At organizations which are proven to be agile and lean in their deployment of tech, only 7% of workers feel this way. Accordingly, any workplace that wants to boost job satisfaction, keep employees more focused, and control the inevitable complexity of growth should take a page from Marie Kondo’s book—metaphorically of course. The KonMaridecluttering method can be interpreted for apps just as it can article of clothing or old toys. After you’ve established which apps are part of your stack, you should observe employees using these tools, and make them a part of the conversation to determine which are “sparking joy” and which take their head out of the game. It could be something as small as an app that doesn’t export into a format recognizable by the next, requiring manual work that represents a bottleneck and detracts from the context surrounding the task. You might discover that some utilities are missing, that apps are outdated, or most commonly, able to be folded into fewer interfaces without sacrificing functionality. The goal of any decluttering endeavor is to establish highly integrated systems that feel as though they’re one. This sometimes means adding, removing, or rearranging layers of the stack with the goal of taking the fewest steps from point A to B, regardless of the business flow. It’s usually the “biggest” solutions that are most highly integrated, such as Google’s G-Suite, Salesforce, and HubSpot, so migrating business flows to these platforms from others may benefit scalability over the long-term and reduce worker stress levels medium-term. (Because short-term, switching tools prompt an accompanying learning curve). To reduce app clutter in the workplace is to empower your employees by listening to them, getting down to their level and understanding the pros and cons of each application they deal with every day. The lesson learned for most companies, often too late, is that adding a new application to your tech stack should be considered more carefully. Will it fuel context switching and distraction, or seamlessly integrate with the tools employees are already using every day? Making important decisions and staying focused on the task at hand is easier when your workers aren’t harried by a tech stack resembling a Rube Goldberg machine. Instead, encourage clear-minded creativity and concentration with a well-defined application stack, and watch as employees reap the rewards on your behalf. In the past few years, with crypto being the hottest thing in the town, we saw an up-rise in security tokens as well. The potential of security tokens is just in the cradle phase of being realized. These tokens are now facing what utility tokens had faced during their introduction; to be taken seriously by investors. I had an opportunity to sit with Antoine Tardif, CEO of a platform, Securities.io, which lists security tokens and publishes news about the tokens. The platform is focused on adding innovative, functional security tokens and bringing them in front of the mass. As per Antoine, the security tokens have a long way to go and have plenty of scopes to improve. The objective of the news platform and token listing site is to help security tokens attract investors. How did the conversation go? Let’s read. How did the idea of launching Securities.io come about? As a cryptocurrency investor, I could see a transition in the marketplace from utility to security tokens. I was witnessing first-hand the evolution of the marketplace, but I was becoming frustrated with the lack of resources that focused exclusively on tokenized securities. Seeing this void in the marketplace we set out to fill it. Why is the focus only on security tokens? Serious institutional investors are not taking utility tokens seriously, and that’s because of the lack of financial transparency when it comes to utility tokens, the lack of regulated exchanges, and the risk of getting hacked. Security tokens will be regulated, and they will be trading on supervised exchanges. The tokens will also have KYC baked in, meaning if there is a hacking, the tokens can be returned to the originally designated token holder. Token holders also have ownership rights which can include dividends and revenue sharing. How do you think the security tokens will benefit real-world applications? This will most benefit venture funds and regular investors by increasing liquidity. This will, in turn, increase the amount of funding available for start-ups. Currently, there’s a problem in the marketplace where angel investors and venture funds need to wait for an average of 5 to 7 years to exit an investment. On average it takes 5 years for a company to be acquired, and it takes 7 years for a company to go IPO. Often this timeline can exceed a decade, and sometimes a company just wants to stay small and will never be acquired or go IPO. In this case, the investor has no option except to avoid investing in non-scalable small companies. With a security token, even with a mandated 12-month holding period before you can liquidate the tokens, the token offers significantly more opportunity for the investor to exit an investment. With this opportunity for exits, investors will be better positioned to invest in new start-ups or other types of securities. There’s also the tokenization of real-world assets such as real estate. This will open the door for smaller investors who are currently locked out of specific markets. For example, an investor in Dubai who think real estate in New York is going to increase can easily buy tokenized real estate and become involved in that market without having to fly to America. Are there any specific criteria for listing the security tokens on Securities.io? Currently, there are not many tokenized securities so we are able to manually review each STO to reach out directly to these companies. Once the volume of STOs increases we will only list STOs which launched by using a token issuance platform that has partnered with us. Till now, which security token exchanges in your opinion are leading the market? The marketplace is new, there’s only one current exchange which is getting any sort of traction which is the OpenFinanceexchange. I personally believe this market will only take off once the tZERO exchange launches which is scheduled for August 6, 2019.
tZERO is a subsidiary of overstock.com and is the brainchild of Patrick Byrne. This is the exchange all the institutions, family offices, and serious investors are waiting for. Once tZERO launches we should see a rapid increase in market adoption of tokenized securities. What steps does Securities.io take to prevent scams and fake news on security tokens from being published? Fake news is a serious concern. Currently, all press releases are personally reviewed by our team prior to publication. We’ve had several unregulated ICOs attempts to get listed by pretending to be STOs. We’ve also had fraudulent websites attempt to get us to profile them. We carefully review requests. The first thing we do is review the team, followed by the project, and we perform extensive due diligence which may include reaching out to our network to vet new projects. Since we expect an influx of new STOs in the 1st quarter of 2019, we plan on partnering with market-leading token issuers. Token issuers perform their own due diligence prior to approving the launch of an STO, and we will be able to piggy-back off this to only list reputable STOs. What benefits will an STO receive on partnering up with Securities.io? We have ambitious goals which include becoming the market leading resource for tokenized securities. This will increase the exposure that STOs receive. STOs that partner with securities.io will receive several benefits including free press releases which will be permanently attached to their token listing page. Partners will also receive an enhanced listing which includes details about institutional investors, and a competitive analysis. We will also enable investors to communicate with the STO directly from the token listing page. RockHer Haute Jewels is meeting the future generation with the first AI-based virtual gemologist, Rosi. Situated in Los Angeles, the luxury brand had collaborated with IBM Watson to enhance customer experience and offer them high-end diamond rings. With the world’s best designers, craftsmen and diamond experts, RockHer is changing the way you purchase diamond jewelry. Their compliance with ethical sourcing and the use of recycled metals have also grabbed attention worldwide. You have been in this industry for a long time. What made you choose diamond jewelry-making business? Jim Vernon: I have been in this industry for over 34 years, in fact, I was raised in the Diamond Industry, my father, Frank Vernon, started Frank Vernon Fine Gems and Jewelry, I have been infatuated with diamonds ever since. How did RockHer Haute Jewels come about? I am intrigued to know the background story. Jim Vernon: I had been servicing Private VIP clientele my entire life, making custom jewelry, finding rare stones, and helping people with custom engagement rings. One day through a mutual acquaintance I was introduced to Adam Stein, Adam was looking to purchase an engagement ring but Adam is one of those people who really want to understand everything, he’s a genius, and much to my dismay really didn’t like the diamond choices I offered, he said I lacked the data to ensure he was getting the best deal. He respected my experience and he thought the diamonds were pretty but something was amiss for him. I sort of challenged him to come up with a better way! That’s what started our friendship and started the path that became RockHer and more importantly our Diamond AI ROSI. Adam is a nanotech guy purifying water using nanomagnets and such; he’s really a little-known hero when it comes to water purification. So in a way only Adam can explain he just walked off and came back 3 months later and said “I want to interview you and all your colleagues, everyone you know, who knows how to buy diamonds, and, I am going to make an algorithm using the latest tech to pick better diamonds than you in about 1 millisecond”. That’s exactly what he did much to my surprise! I was shocked and as I continued to work with Adam the diamond picks became better and better, the computer could analyze a million stones and started saving us an inordinate amount of time spend on finding diamonds for clients. When the computer out picked me, (I spend my entire adult life understanding diamonds and how clients think) I knew we had something we really needed to bring to the customers, we could not keep this tech for ourselves. Jim Vernon: We take a drastically different approach than other Online Jewelers and extremely different than other retailers. We make each and every order from scratch. When you place an order on our site you not only pick the ring style you love but the center diamond as well. From that point, our team of CAD designers start from scratch and computer customize that ring to both the center stone size and the finger size. We make sure each ring is proportionate in its original design, and that each piece has balance. From there our amazing 3d printers print that one of a kind model just for the client. Then we create a mold of that one of a kind piece and we use a well-known process called lost casting to fashion that mold out of gold or platinum. From there the diamonds are all hand set under a microscope to ensure a perfect fit and our team of polishers and finishers finalize the piece. From there it’s off the to the QC department where each one of the pieces is inspected for 20 different parameters, once the piece passes QC it can be shipped. This method varies greatly from others who manufacture in a one size fits all method and stretch and or cut the rings to make their shipping timeframes smaller, this leads to poorly made jewelry. “RockHer only uses recycled gold and platinum.” Can you please elaborate on this? Jim Vernon: Tracing precious metals back to their source to confirm they have been mined responsibly is too difficult, so, we have decided to work only with recycled gold and platinum. What are some of the advancements or changes the diamond jewelry industry is going through these days? Jim Vernon: Massive change, massive consumer habit shifts, and an influx of manmade diamonds are all overwhelming the industry. We have decided to remain true to the origin of engagement rings and diamond romance, we only use natural diamonds, and these diamonds are billions of years old and really represent the longevity of the love for all eternity two people may be lucky enough to share. How different is the customer’s approach from when you had started in this business? Jim Vernon: We initially started by just really focusing on our diamond AI, but we later realized that the diamond was only one piece of the puzzle, granted, a very important part in terms of dollars for the clients but bottom line they needed help with the ring itself. We found that customers were tired of going to retailers and simply picking a ring off the shelf, almost feels anti climatic to them; they want something special made just for them. We changed the sites focus to made to order engagement rings, everything is custom made just for the client, and the AI ROSI really helps them find the best diamond. We will be launching ROSI with a ring builder soon so she can assist you with finding the best ring for your budget, we do have over 5k styles so it can be overwhelming. In a world where people are becoming more and more budget conscious and at the same time look at high-quality, how does RockHer as a luxury brand operate? Jim Vernon: We use the latest tech to accomplish this feat, from 3D printers, to AI, to the latest CRM technology, Rockher is lean, and we pride ourselves on having the highest quality jewelry in the business, plus, when your factory is next door we get to really make sure the team is being over ambitious on quality. What more can you tell about ROSI? How does it function and what has been the reaction or feedback of your customers? Jim Vernon: The customer’s love ROSI, almost 90% of the users query ROSI, only about 10% go right to the regular manual diamond search, the reason is the users need help. ROSI also has a fabulous compare function, she can compare any GIA certified diamond found online to what RockHercurrently has in inventory, and she will give you a real answer on which stone is the better deal. In terms of how ROSI works, obviously most of it is proprietary, however, users need to know that we have a direct backend API to the GIA, the foremost lab in the world for grading diamonds, and we pull a lot of data to ensure ROSI’s results are spot on. A lot of other sites simple don’t have authorization to even be connected to the GIA. In terms of how she grades, we deploy a little machine learning market prediction plus over 30 different diamond specifications per stone to determine the best value. ROSI calculates approximately over 1M computations per query to find the user the best diamond for their budget. We also use query information to change the preferences of ROSI, so as time progresses she will understand what users want more and more. As you have already implemented AI and created a virtual gemologist, what do you think about the changes AI is bringing in customer experience? Jim Vernon: Bottom line, we try not to get lost in the weeds of AI or ML where one is simply pushing the limits of that tech, that is not our forte, what we simply want is the user to have the simplest experience getting a real unbiased diamond pick for their budget. Tech that helps the customer is what we are about. Lastly, what is your ideal diamond ring and to whom would you like to present it? Jim Vernon: That is too tough a question to answer; in reality, my ideal diamond ring is whatever makes the client happiest….each and every client is treated with equal love no matter their budget, that’s what makes Rockher.com great. Before getting to know more about The Resilience Project in the words of its CEO, Sven Hansen, let’s discuss a little about what The Resilience Institute does. With over 20 years of experience, The Resilience Institute aims to deliver practical, highly effective integrated Resilience training that will lead to a healthy workforce and stronger minds. The process combines neuroscience, positive psychology, emotional intelligence, and preventative medicine. The project boasts of having achieved a 0.55 increase in Resilience Ratio of the participants who had received their training. Recently, the Global Resilience Report 2018 was published which elaborately compares resilience strength of different regions. Dr. Sven Hansen expresses, “Humans are an integral mix of physical, emotional and cognitive attributes. Our recommendation is to aim for integrated solutions that address human growth and risk using a common language and model.”. I had a chance to have a conversation with him and here are some of the interesting discussions about resilience in general and his institute. The meaning of “resilience” goes beyond the capability of enduring tough times. What does “resilience” denote for you? Dr. Hansen: It’s a learned ability to bounce, grow, connect and flow. Bounce is for the hard times both sudden and protracted. Grow is the physical, emotional and mental fitness for life. Connect builds understanding, trust, and care towards others. Flow brings our talents and skills to meaningful challenges. They are interconnected. To succeed in the 21st Century they are essential. So, how did the concept of The Resilience Institute come to life? Dr. Hansen: I grew up in a medical family focused on prevention but it was my early experience as a young sports medicine doctor. During that time, it came obvious to me that one could prevent injuries, increase speed, enhance skill, train the mind and work in the team better. Around 1991, I asked this question to myself that if athletes can learn these advanced skills, would it improve business results as well? What if organizations could be a vehicle to get these ideas to more people? This was a tough sell initially but now leading organizations have embraced the concept. It is a very exciting and fulfilling field to be in. “Resilience is learned over time.” Can you elaborate on this statement? Dr. Hansen: Resilience is not a genetic gift or a trait. We can all learn resilience and if we keep refining the practice, we continue to get better. For example, if you stretch out your muscles with good technique every day you can be a very flexible person as you grow old. This will protect your joints, enhance your movement and maintain good posture. You will look, feel and be better. At first, it is difficult to learn and to motivate, then you develop a practice and finally, it becomes a habit. Exactly the same is true for muscle strength, impulse control, empathy, attention, etc. According to your Global Resilience Report 2018, Netherlands ranks 1st in resilience factor. But, the report also says that the Dutch are the most self-critical, a liable factor. The rank and the report kind of contradict each other. So, what is actually the reason behind the ranking of Netherlands? How does resilience intervention actually work? Do you follow any specific model? It is worth noting that until recently, most clients simply wanted a workshop to “fix resilience”. We now recognize that it takes time, practice and repetition. We have learned from sports. Expertise, safe and effective practice and skilled facilitation of the process are necessary. In your opinion, which asset(s) contributes to the resilience factor most? Dr. Hansen: Well, in terms of correlation with resilience ratio and the practices of the most resilient people, we see focus, presence, fulfillment, and optimism at the top of both lists. We can imagine someone being fully focused and present with good posture and an upbeat, hopeful stance as the goal. Health awareness, fitness, sleep, relaxation, and nutrition tend to be the first level gains people make in the first phase of an intervention. Dr. Hansen: Being honest, it depends on how we define success. In the case of high performers in sport, combat or performing arts it is clearly an enabler. If we define success as wealth or power, not necessarily, many are anxious, hostile, narcissistic, manic and sick. Most successful leaders are planning resilience into their lives. When they don’t, as in the Elon Musk tweets of late, they are scrutinized by the media and the company suffers. What we do believe is that the skills required to succeed in our modern lives – sedentary, plugged into a screen, overwhelmed by data and pace – did not come with our hunter-gatherer experience. Humans have to learn these skills if they are going to keep up and be successful. This is clearly evident in family life, education, healthcare, getting employed, upskilling, and finding meaning in a very confusing time. Can you describe the Resilience App a little? How can we benefit from it? Dr. Hansen: The App is a digital support tool that integrates the measure, learn and achieve cycle. In one secure system, you can assess yourself, define your needs, set goals, learn and celebrate success. We are huge fans of people getting together to learn, debate and practice. The App is a convenient complement that allows you to stay engaged quickly and efficiently. With a significant amount of learning through short videos, practice tips, and selected references, one can really own and share your resilience journey. It is based on short bursts of information and easy access to further study with built-in content tests to assess your learning. What has been the most successful “resilience intervention” story for you so far? Dr. Hansen: We are blessed to be able to help hundreds of organizations but I think one that was very meaningful was helping a bank through the Christchurch earthquakes. The bank committed to providing support to their people and employees families. The city was flattened and many people lost homes, offices and loved places. The earth shook several times a day triggering debilitating uncertainty and anxiety. We ran a number of workshops helping people understand how to negotiate this threatening time. We worked through the details of how to bounce forward, how to stay calm in a shake, how to re-establish sleep patterns, how to recreate daily disciplines and how to master destructive emotions and thoughts. Leaders were supportive. It was great to see a long-term client apply resilience in such a helpful way. Lastly, what would your advice be for a young millennial to become more resilient? Dr. Hansen: This is a question in the minds of many caring people. Many reports echo the themes of increasing suffering from attention disorders, social withdrawal, self-harming, anxiety, hostility, and depression. At the same time, many millennials are thriving. Our data shows that millennials score lower in focus, purpose, emotional agility, flow, and decisiveness. They are also more prone to sleep disorders, boredom, disengaged, self-critical, and worry. All of these can be improved with awareness and simple skills. As we all are well aware, the practice of bullying has been going on for decades. Before the onset of the internet, bullying was limited within the walls of various educational institutions where a group of students took pleasure by harassing and intimidating others. Nowadays, with the advancement of technology, this heinous practice has been upgraded as well in the form of Cyberbullying and internet trolls and can be considered one of the greatest scourges of the modern world both for businesses and individuals. One of the main problems with Cyberbullying is that it not only affects the business but is capable of upsetting a large percentage of individuals as well. This practice along with unavoidable internet trolling can effectively malign the reputation of a certain individual, entrepreneurs, and small business organizations that are yet to make their marks in the market with their services or products. Very recently, some very reputed Brazilian magazines like Época have been extremely vocal about internet trolls. This practice is posing a serious problem in these parts of the world as well. Here, a few aspects of Cyberbullying and the role of online reputation management programs against such practice would be discussed. So, what are the reasons? A lot about Power: People who feel powerless in their own reality sometimes tend to use the internet as a tool to exert their power over others. Making acerbic comments anonymously about a certain person or trolling them on various social networking sites provide them with an unbridled sense of power. Sometimes people who are bullied in real life take this virtual world as a means of revenge as well. Social Status and Popularity: Posting hateful rumors is one of the most common methods of internet trolling and Cyberbullying. It has been observed in many cases that people behind these practices are often attention seekers. Posting such comments and spreading slanderous rumors are capable of grabbing an unbelievable amount of attention. As most people nowadays spend their time on the internet, these trolls can be an effective way to become popular and to gain social status. It is often for entertainment and sadistic pleasure: There are several instances where people get involved in internet trolling simply for the sake of entertainment and personal pleasure. This group of people feels sadistic pleasure by bothering and harassing others and do not possess the sensitivity to figure out the consequences of their activities on others. These bullies can become even more invigorated if the victim responds in an aggressive manner. Besides these reasons, Cyberbullying can also be a form of vigilantism where a certain individual makes the internet the tool to intimidate or punish a traditional bully or delinquent. However, this type of Cyberbullying is extremely rare. This is where Online Reputation Management comes to use. By the definition, Online reputation management refers to the process of controlling the internet materials that show up on your internet. The process involves eliminating any kind of damaging or slanderous contents that can potentially damage the website. Ethical hacker Fernando Azevedo explained the intricacies of online reputation management in his book Online Reputation Management Secrets. Fernando Azevedo also formed his brainchild ORM Company Silicon Minds, to help businesses keep the cyber-bullies away from denigrating your business. Why is Online Reputation Management the need of time? Gaining Trust: Choosing an online reputation management company can be an incredible way to acquire the trust of your potential customers. As most people nowadays rely on online reviews from various websites, selecting a reputed ORM company would help you put up good words about your company in various review websites by excluding slanderous remarks. With a decent amount of reputation, selling your products online would be much easier irrespective of the size of your business or brand recognition. Increasing Profitability: Better online reputation always attracts more potential customers or other business organizations to your company. When customers search for a service or product that you provide, they would come across many other companies who are the potential competitors of your company. With a reputed online reputation management company, your organization would mostly have positive reviews on various websites and would also rank higher than your competitors. Therefore, it is quite evident that ORM can be a great way to make your business more lucrative. Conflict Resolution: Managing your company’s online reputation can be a great way to provide a constructive response to baseless criticisms and negative reviews. Decent ORM companies would provide you with certain platforms that would notify you whenever a review is posted about your company presenting you the perfect opportunity for conflict resolution and maintaining the reputation of your company. 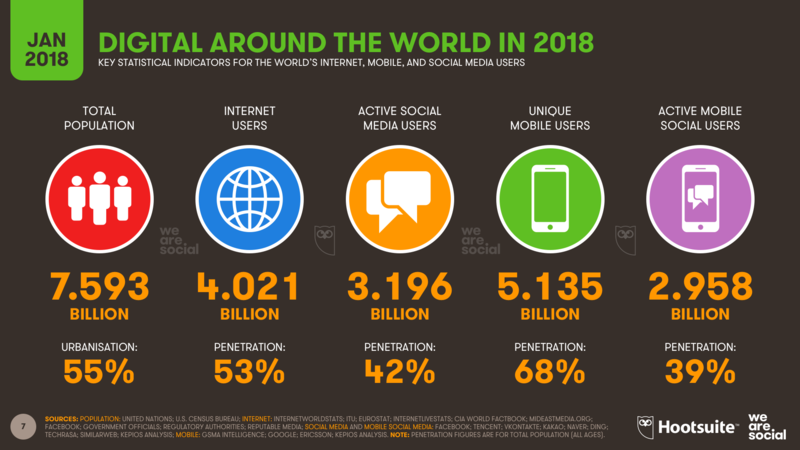 As of January 2018, there are almost 7.6 billion digital users worldwide. Roughly 4 billion of those are internet users. That means that over half the world is now online, with a quarter of those users joining in 2017 alone. Social media usage is at nearly 3.2 billion. Facebook is still the most popular platform at 2.17 billion users, with YouTube the second runner-up at 1.5 billion. For better or worse, technology is here to stay, and companies that want to stay in business will have to stay abreast of constantly evolving trends. This includes trends in technology as well as social trends like the health-and-wellness industry, which has become less of a trend than a lifestyle, thanks to younger generations’ interest in organic food and natural products. Almost 1.8 billion people, or 23% of the global population, make purchases digitally. Many of these people are millennials. Millennials love online shopping. They also represent the largest generation of consumers in the US. While India trails the rest of the world in terms of online shopping at only 26% of the population, the country’s digital imprint is expected to increase. This is due to several factors, including an increasingly free-market economy; the demonetization of cash currency that began in November 2016, which is designed to increase the country’s digital imprint; and the growing emphasis on entrepreneurship, startups, and technology. With millions of people queuing up to buy an iPhone every year, calling smartphones “popular” is something of an understatement. Over two-thirds of the world’s population has a mobile device and most of those devices are smartphones. 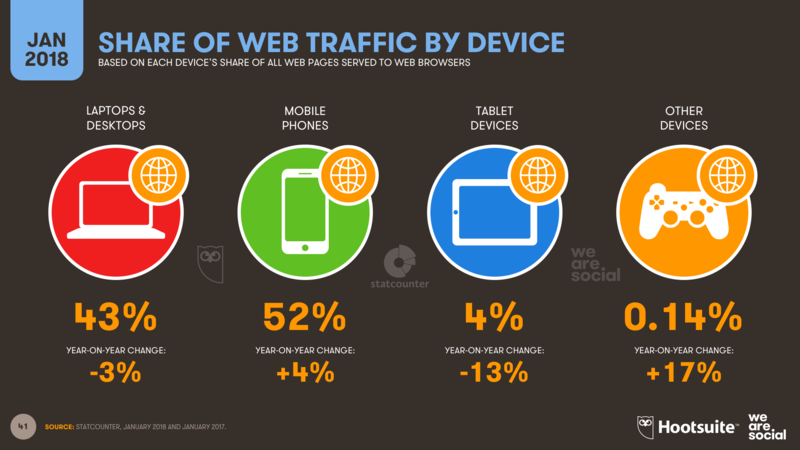 Combined, mobile usage accounts for 52% of web traffic, versus 43% for desktops and laptops. In India, smartphone usage is a whopping four times greater than desktop usage. 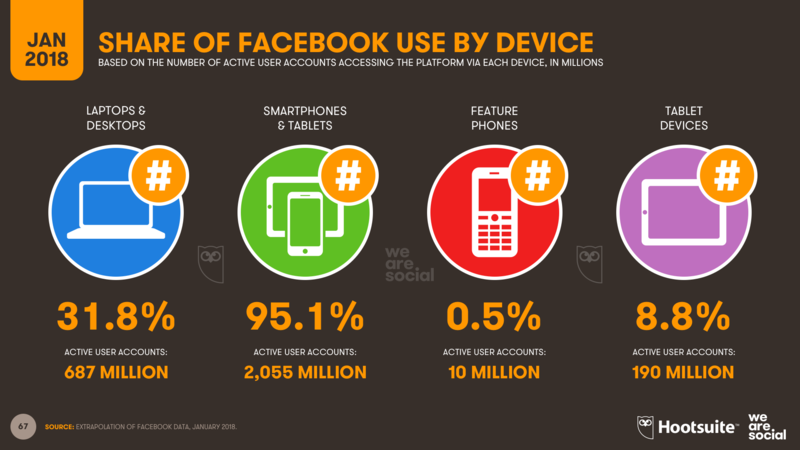 For Facebook, this means that 91.5% of its active users access the site via smartphone, while only 31.8% do so from a desktop or laptop. According to another survey, 63% of millennials are also using their smartphones to make purchases online, while the 53% that prefer to shop in-store often use their mobile device to search for coupons, snap and post pics of potential purchases, and browse the internet while they’re waiting in line. Current statistics indicate that increased mobile usage will continue to fuel online interactions and sales among the next generation of digital users. Social media isn’t going anywhere either. According to Rival IQ, 30% of online shoppers are willing to use platforms like Facebook, Instagram, and Twitter to make purchases digitally. Businesses with a strong social media presence are much more likely to attract a millennial shopper, especially if they have a fast response time for questions or complaints, as well as a professional demeanor. Social media also plays an important role in the time before and after a purchase, with shoppers liking, commenting, and sharing items with their friends and followers online. According to HubSpot, video marketing is also on the rise, with consumers being four times more likely to watch a product video than to read a product description. The same study indicates that 45% of people watch an hour’s worth of Facebook or YouTube videos per week. Thus, if India’s economy continues to grow in relation to its population, the nation is projected to have the third largest consumer market in 2030, ahead of Japan and Germany. That means that more people will be investing in technology and using it to make purchases digitally. It also means that it’ll be easier to buy, sell, market, and share cross-cultural commodities – such as natural botanicals, essential oils, and other holistic supplements – with the global community. Foreign exchange (Forex) and Contract for Difference, popularly known as CFD trading has become immensely popular among both novice and experienced traders over the past few years. Apart from the gigantic trading volume that CFD trading offers to the investors, there are other reasons behind the briskly increasing popularity of this trading process. With the introduction of new and innovative technological applications like trading bots, automated trading platform, and many others, CFD trading has become even more accessible and lucrative for the aspiring entrepreneurs across the globe. In this article, a few aspects of CFD trading would be discussed along with the reasons why the new technological implementations could design an infallible business paradigm for new entrepreneurs. To adumbrate the idea of CFD trading, it can be referred to as an effective financial instrument that allows the traders to invest in a particular asset without actually owning it. It means, when you involve yourself in a CFD contract, you would be offered the leeway to speculate over the price changes of a particular asset, despite owning it. In a CFD contract, the seller has to pay the difference in price between the current value of the asset and its value during the time of the contract. In case the balance becomes negative, the buyer has to pay the seller the difference. You can secure a significant amount of profit in this trading as you would be able to take advantage of both moving up and down of an asset’s price during the trading period. Having full control over the leverage and the trading process. CFD trading websites are free from the influence of middlemen which allows the traders to pay much affordable brokerage price. CFD trading is the only financial instrument that allows you to make the profit from a negative market. A start-up company refers to a newly emerged business or entrepreneurial venture that aims to fulfill a marketplace paradigm by designing a viable paradigm. With new traders and investors making their way in the CFD market, every day more start-ups are transforming into legitimate business organizations. These start-ups endeavor fulfill a vast range of business requirements in various fields starting from different branches of science and technology like aeronautics, information technology, combustion science and engineering, etc. to fields like analytics and marketing. FinTech or Financial Technology is an ingenious technology that tries to ameliorate various financial activities with the help of technology. The FinTech industry launched a new software program named FinTech Ltd. for Forex and CFD traders across the globe. The software is an automated robot that offers round the clock customer service to the traders long with other beneficial features. The software also works with properly licensed online brokerage platforms. With the implementation of FinTech technology in CFD trading, finding out lucrative opportunities and difference in price would have become much easier and accurate. Also, FinTech Ltd. offers efficient tools to the new entrepreneurs. FinTech consists of several start-up companies around the world that are growing rapidly because of the technological support. Some of the most well-known FinTech companies include Due.com, SoFi, Planwise, Plaid, Giftly, FinCon, and many more. So, if CFD collaborates with FinTech, the new CFD start-ups are likely to experience a similar growth to turn out as major trading companies in future. With the advancement of technology, new entrepreneurs and traders are exploring new domains for starting a lucrative business. Cryptocurrency will certainly belong to the group of such unexplored assets. You can implement the financial instrument of CFD in speculating prices of various cryptocurrencies like Bitcoin, Ethereum, Ripple, Litecoin, and many more. Sensing the huge number of opportunities in this market, FinTech is also collaborating with various cryptocurrencies to strengthen their ecosystem. So, as a burgeoning entrepreneur, you can always turn to cryptocurrency while getting yourself involved in CFD trading. CFD trading has already become very popular for its benefits and low cost and with the introduction of FinTech and new trading opportunities like cryptocurrency and blockchain technology, it can become one of the most preferable trading options as well. Therefore, if you are counting on becoming a successful entrepreneur in future, now is the time to choose CFD. Startups have big dreams and they set a fast pace to reach them. Once you start to gain momentum and are growing fast, it can be easy to focus so much on scaling up that you don’t notice the smaller wins happening along the way, like converting each and every new user. But when you’re at an earlier stage, every small win is something that you worked for, whether that’s a new enterprise customer or a single website visitor. You’re still somewhat scrambling, and can feel the work that goes into acquiring each new lead and audience member. How will you make the most of them? Website traffic is a stream of potential customers walking into your business, not just numbers in your analytics dashboard. And just like in a physical store, your job isn’t over once you’ve gotten them in the door. You still need to get them to buy. When you’re starting out, traffic’s likely lower. While many would be quick to pinpoint that as a problem to be solved, it can also be an opportunity to pay closer attention to the visitors you do have. You can further engage them, learn from them, and more to make up for the fact that you haven’t had a million hits. In addition to increasing traffic, you should also be looking to increase the value of your existing traffic, whether that’s through increasing conversions or collecting insights. The important thing is to remember that someone landing on your site is only at the start of their journey. Don’t neglect the path to conversion in your focus on growing traffic. Especially when it’s low, you should always be looking for how to make it easier for visitors to move to the next step in your marketing funnel. For example, is there a plan in place to capture users who don’t convert on their first visit? If someone leaves without signing up, go find them again. Run retargeting campaigns to follow and reach people wherever else they spend time on the internet and recapture them. This gives you more time and opportunities to move them through the conversion funnel outside of your own website. Say your blog section gets traffic that doesn’t convert well on-site. You can use it to pixel your audience and run ads back to them. Showing them an additional content offer or free trial can bring them back to your site and to the next step in your buyer’s journey. You can also learn more about your limited visitors with audience intelligence. Having a smaller audience with fewer segments and pockets of customers, you have the opportunity to dive deeper into each one of the people engaging with your owned media presence. Tracking software like Leadfeeder can repackage your Google Analytics data as dashboards of leads and integrated CRM entries to give you sales insights on your website visitors. You can segment your custom feeds per UTM parameter, which is especially useful when testing numerous paid media channels. Not that you should drop your email automation program. It’s just that in the age of conversational selling, no one wants to opt into email drips just to flip through a pdf anymore. It takes a more sophisticated mix of CRM-based lead scoring systems, cross-channel paid targeting, triggered onsite personalized messaging, content upgrades, social bots and more. All along the winding journey, the CRM collects signals at every touchpoint. This level of visibility lets you continuously learn about the predictive lifetime value of your audience, at a stage in your business when you need to squeeze as much value as you can from limited data signals. Gaining more insights about users lets you hone your personas and audience targeting for marketing campaigns and advertising. Plus such granular insights allow you experiment with more assertive social selling initiatives. You also have the opportunity to engage visitors in real-time conversations when they land on your site, instead of waiting for them to find and take the next step on their own. Onsite messaging platforms like Drift let you create a more personal experience where you can start building a relationship with someone from their very first visit. This makes your website a much more effective conversion tool. For example, LeadPages targeted pages visited by their highest value leads with real-time messaging to increase their conversion rate by 36% without a change in traffic. Finally, so many startups are overeager to A/B test before their traffic is ready for it. But that doesn’t mean you can’t further optimize your website at all while it’s still growing. Other methods like Hotjar heatmap analytics help you see how users are interacting with your site to the tune of results like 30% more conversions. That allows you to see how different users use your site and where they get stuck in the conversion process so you can make it as easy as possible. With measures like these, you aren’t just attracting website visitors, you’re also working to convert and activate them just as well. When this entire buyer’s journey is laid out clearly on your website, smaller traffic numbers won’t need to have a detrimental effect on your startup’s growth.